Özet: Bu çalışmanın amacı, biyoloji öğretiminde yaşam temelli öğrenme yaklaşımının öğrencilerin başarılarına ve tutumlarına etkilerini araştırmaktır. Ilköğretim sınıf öğretmenliği bölümünden seçilen 41 kişilik deneysel gurupta yaşam temelli öğrenme yaklaşımı, 53 kişilik kontrol gurubunda geleneksel öğrenme yaklaşımı aynı öğretmen tarafından sekiz haftalık bir periyotta uygulanmıştır. Nicel veri toplamak için her biyoloji konusu için hazırlana n başarı testi ve tutum testi, nitel veri toplamak için açık uçlu sorulardan oluşan görüşme formu kullanılmıştır. Her iki gruba ön ve son test olarak akademik bilim başarı testi ve tutum testi uygulanmıştır. Görüşme formu sadece deney gurubuna uygulamadan sonra uygulanmıştır. Analiz sonuçları yaşam temelli öğrenme ve geleneksel öğrenme grupları arasında öğrencilerin başarıları ve tutumları açısından anlamlı bir farklılığın olduğunu göstermiştir. Görüşme formunun sonuçları da elde edilen bu bulguları desteklemiştir. Abstract: The aim of this study is to determine effect of “context based learning approach” towards student’s biology success and attitudes on biology course. This study was applied to two groups’ first grade students that include 53 students in control group that designed on traditional learning approach and 41 students in experimental group that designed on context based approach by the same teacher over a period of 8 weeks in department of elementary learning education. Achievements test prepared for each biology subjects and attitude test towards biology courses were used as means of collecting quantitative data, interview form which includes open ended questions were implemented as means of collecting qualitative data. Multiple choice academic science achievement test and attitude test towards biology were given to both groups as pre-tests and post-tests. Interview form which includes open ended questions was given only experimental group after context based learning. The result of analysis shows that there is a meaningful difference between context based learning approach and traditional learning on student’s success and attitudes towards biology. The results of interview form which was implemented on experimental group in order to support obtained findings are in favour of our study. Context based learning approach, Achievement, Attitude, Biology lesson, Elementary learning education. Bennett, J., Holman, J., (2003). Context-based approaches to the teaching of chemistry: what are they and what are their effects? Gilbert, J.K., Jong De O., Justi, R., Treagust, D., F., Van Driel, J., H., (Eds) Chemical Education: Towards Research-Based Practice, (165-185) Kluwer Academic Publishers, New York, Boston, Dordrecht, London, Moscow. Bennett, J., 2003. Teaching and Learning Science, New York USA, Continuum publish. Bennett, J., Campbell, B., Hogarth, S. and Lubben, F. (2005b). A systematic review of the effects of context-based and STS paroaches in science teaching. In C. Kasanda, L. Muhammed, S. Akpo and E. Ngololo (Eds): Proceedings of the 13th Annual Conference of the Southern African Association for Research in Mathematics, Science and Technology Education, (pp. 53-58).Windhoak, Namibia. Bennett, J. and Lubben, F. (2006). Context based chemistry: the Salters approach. International Journal of Science Education, 28 (9), 999-1015. Gilbert, J. K. (2006). Context based chemistry education on the nature of “context” in chemical education. International Journal of Science Education, 28 (9), 957-976. Murphy, P., Whitelegg, E., (2006). Girls in the Physics Classroom: A Review of the Research on the Participation of Girls in Physics. Institute of Physics Report. Nentwig, P. M., Parchmann, I., Grasel, C., Ralle, B., (2007). Chemie im kontext: situating learn- ing in relevant contexts while systemetically developing basic chemical concepts. Journal of Chemical Education, 84 (9), 1439- 1444. Özay Köse E. and Çam Tosun F., (2013). Context Based Learning’ Effects on Achievement and Scientific Process Skills in Biology Teaching. Iğdır Üniversitesi Fen Bilimleri Enstitüsü Dergisi / Iğdır Univ. J. Inst. Sci. & Tech. 3(4), 33-41. Pekel, O., F., (2005). DNA, Gen, Kromozom kavramlarının anlaşılmasında kavramsal değişim yaklaşımının etkinliğinin İncelenmesi, Doktora tezi, Fen Bilimleri Enstitüsü, Atatürk Üniversitesi, Erzurum. Ramsden, J.M. (1994). Context and activity-based science: some teachers’ views of the effects on students. School Science Review, 75 (272), 7-14. Schwartz, A. T. (2006). Contextualized chemistry education: the American experience. Internation- al Journal of Science Education, 28 (9), 977- 998. Williams, B., Anderson, M. C., & Day, R. (2007). Undergraduate nursing students’ knowledge of and attitudes toward aging: comparison of context-based learning and a traditional program. The Journal of nursing education, 46(3), 115-120. ISNAD ÖZAY KÖSE, ESRA , ÇAM TOSUN, FİGEN . "BİYOLOJİDE YAŞAM TEMLLİ ÖĞRENMENİN ÖĞRENCİLERİN BAŞARI VE TUTUMLARINA ETKİSİ". 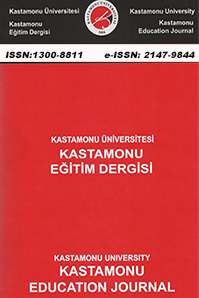 Kastamonu Eğitim Dergisi 23 / 4 (December 2015): 1425-1436.